If you already have all the ingredients you’d need to mix up a Manhattan, a Mint Julep, an Old Fashioned, or a Whiskey Sour, chances are pretty good that you know a thing or two about Bourbon cocktails. But have you ever heard of a Bardstown Bubbler? What about a Proven Perfection? From classic recipes to complex concoctions, cocktails made with Bourbon are as unique and intriguing as the land from which Bourbon hails: Bardstown, Kentucky. The Bourbon industry has been the economic backbone of Bardstown for decades. No less than six heritage brand distilleries call the beautiful small town home, as do several newer, craft distilleries. Thus, it should come as no surprise that a sip of really great Bourbon can help tell the true story of Bardstown. And sometimes, that story is emphasized by other ingredients. 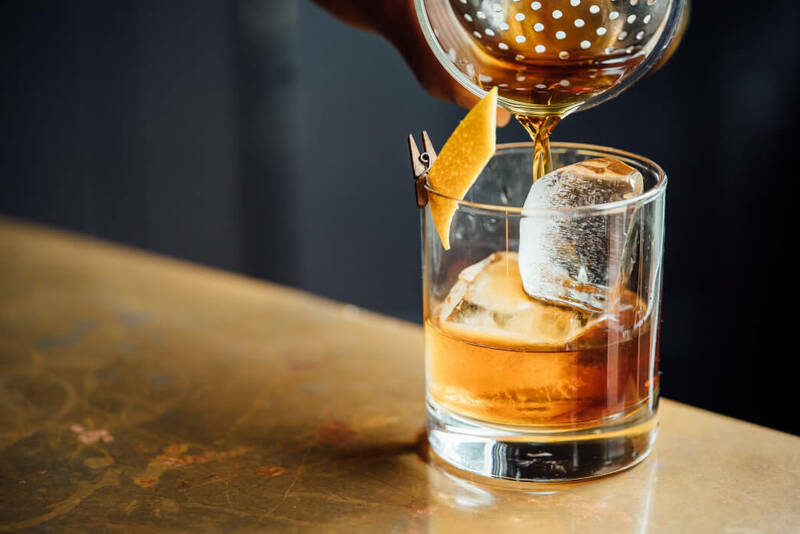 With a healthy dose of Bourbon ingenuity, modern mixologists are helping debunk the myth that adding even a drop of water to great Bourbon will ruin the whiskey’s flavor. They’re coming up with new and unexpected combinations that result in some tongue-tingling and refreshingly original Bourbon cocktails. So, next time you’re looking for some creative cocktail inspirations, try an original recipe from The Bourbon Capital of the World®. The Bardstown Bubbler is an easy-to-make, effervescent creation by Howard Keene, owner of theKentucky Bourbon Marketplace and renowned Bourbon aficionado. This drink features the refreshing flavors of Campari and sweet champagne, along with a bold citrus kick and, of course, your very favorite Bourbon. Directions: Fill a cocktail shaker with ice. Add Bourbon, Campari, lemon juice, simple syrup, and peach bitters and stir just long enough to chill the liquid and combine ingredients. Strain into a rocks glass over fresh ice, and top with a floating pour of sweet champagne. Want to tryAmerica’s Best Manhattan, Bardstown-style? Check out the Proven Perfect Bourbon cocktail created by award-winning bartender Allison Widdecombe. The Proven Perfect is inspired by a traditional Bourbon Manhattan, but in this version, Widdecombe suggests swapping out the traditionally sweet and dry vermouths for a ruby port and bitter orange liqueur. The result is a complex drink that’s drier than your typical Manhattan, but still super balanced and easy to sip. Directions: Combine the Bourbon, port, Bittermens Amère Nouvelle, and Fernet-Branca in a cocktail shaker with 3-4 ice cubes. Stir just long enough to chill the liquid and mix ingredients thoroughly, then strain into a chilled martini glass. Garnish with a lemon twist and maraschino cherry. The Official Drink of the 2017Kentucky Bourbon Festival, The Petal Pusher is a fresh lavender and grapefruit concoction that’ll have you thirsting for seconds and pushing for thirds. Originally created by Colleen McCarthy-Clarke for Martini’s Italian Bistro in Louisville, Kentucky, The Petal Pusher features Four Roses Single Barrel Bourbon for its full-bodied flavor and smooth, mellow finish. Directions: In a cocktail shaker without ice, combine the Bourbon, lavender syrup, grapefruit juice, ruby red grapefruit wedges, grapefruit bitters, and mint leaves. Muddle everything thoroughly, and add ice. Shake to chill the liquid, and strain into a highball glass filled with fresh ice. Top it all off with a splash of grapefruit soda, and garnish with lavender stick and mint sprig. The Bardstown Sling was created by renowned bar professional and master mixologist, Tony Abou-Ganim, to show off the unique flavor profile of Maker’s Mark® Bourbon. Abou-Ganim likens his Bourbon creation’s flavor to that of ripe peaches, making it a superb cocktail to enjoy on summer evenings with friends. Directions: In an ice-filled cocktail shaker, pour the Bourbon, peach brandy, peach puree, fresh lemon sour, and add a few dashes of bitters. Shake until well-blended, then strain over fresh ice in a rocks glass. Garnish with a sprinkle of nutmeg and enjoy! * To make the fresh lemon sour, mix 2 parts freshly squeezed lemon juice with 1 part simple syrup. The Apricot and Honey Bourbon Sour was created by popular mixology bloggers Jay and Leah Hall. It features a citrus syrup that’s easy enough for any budding bartender to make at home, and has warm, sweet flavors to match on crisp fall days. When writing about the inspiration for this cocktail on their blog Gastronom, Hall said, “Bourbon and honey are a winning combination.” He explained that adding the fruity apricot syrup pulls out warm caramel notes from the Bourbon and brings out the sweetness of the honey. Sounds like the perfect combination! Directions: Combine the Bourbon, homemade syrup, lemon juice, and bitters in a drinking glass of your choice. Add fresh ice and stir with a cocktail straw to chill. Garnish with mint leaves. Now try the real thing! Of course, you can make these delicious Bourbon cocktails at home—and we certainly recommend that you do—but sometimes, there’s nothing quite like getting something straight from the source. Visit Bardstown to sip, see, and savor on your next trip.